As it’s been over a year since we last ran a Create a Space Marine Chapter competition I thought it was about time we did another. 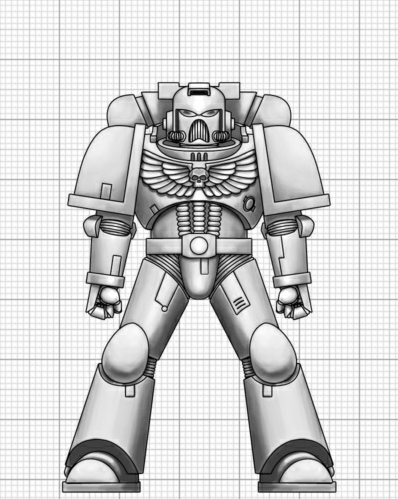 All you need to do is create your own Space Marine chapter using the guidelines below. And what will you earn for your efforts? Nothing short of a Space Marine captain model painted in the winning chapter’s livery by our friends over at Warpforged Miniatures. Those of a heretical natures should feel free to submit renegades/traitors/Chaos marine backgrounds. Entries should include an image depicting colour scheme. I recommend you use the Space Marine painted on Bolter & Chainsword. You can also include an icon/chapter markings is you wish. Your work is your own but intellectual property rests squarely with the Games Workshop and is only used under fair use. I reserve the right to publish any submissions in a strictly non-profit capacity. The published writer/s will be credited accordingly. Submissions should attempt to evoke a sense of history and grandeur about their chapter. Word limit is 3,000 words (+/- 10%). Space Marine colour schemes and chapter markings should be attached to the email as JPEGs only. All entries must be received by Monday 30th September 2013 after which a single winner will be chosen. Submissions received after this will not be considered. All written submissions must be sent as text, not PDF or any type of image. Chapter livery should be in jpg format and attached with the submission and emailed to theshellcase@hotmail.co.uk. Please title the email Create a Space Marine Comp just in case it ends up in the Junk Folder. Submissions must include at the top of the first page; the entrants name, a contact email address, Twitter name if applicable and name of the Chapter. The winning entry will be published initially on The Shell Case website.